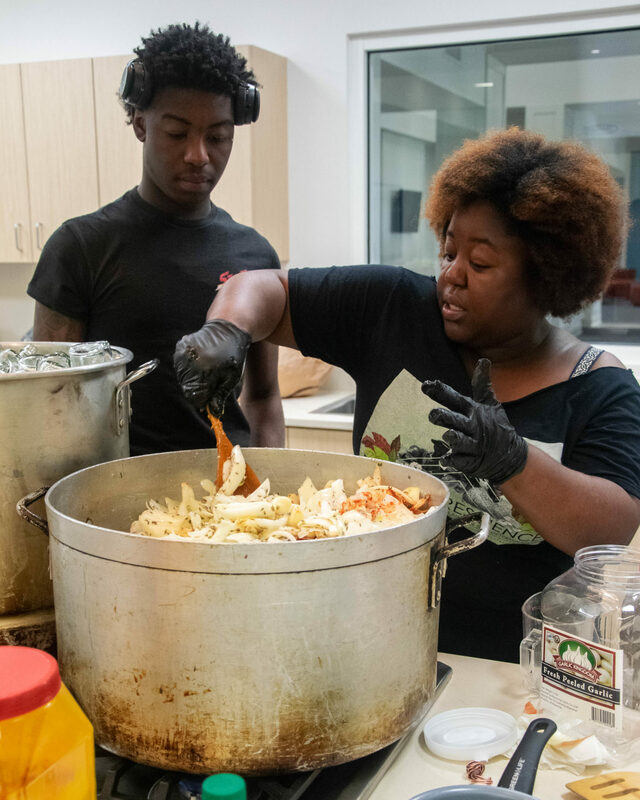 Abiodun Henderson, founder of Gangstas to Growers (G2G), works with 18 year old trainee Zion Franklin to make a batch of SweetSol, G2G’s signature hot sauce. G2G is just one agri-business program aimed at Black youth in Atlanta; Community Movement Builders (CMB) in the Pittsburgh neighborhood is also developing two worker-owned farming cooperatives to ward off gentrifying forces. All photos by Keamber Pearson. While Abiodun Henderson is focused on creating solutions for the future, her work is very much informed by the past. As she mixes fresh ingredients into a stockpot on one of the first Saturdays of spring, she talks to a group of Spelman College students about Reconstruction, the post-Civil War era in which Black people made unprecedented economic gains. Henderson often references Reconstruction because it was a time when Black people had greater forms of economic self sufficiency, often in the form of land and business ownership. She believes that Black communities need to return to that self-sufficiency in order to heal from violence and anti-Blackness. That’s why since 2011, the millennial has worked with Black youth in Southwest Atlanta to reclaim the ways of their ancestors who tilled their own land and grew their own food. While holding summer camps to teach young people about urban farming, Henderson identified “love, knowledge, and money” as essentials that were missing from their lives. Thus, Gangstas to Growers (G2G) was born in 2016. G2G is a three-month program that empowers at-risk and formerly incarcerated youth ages 18 to 24 through agriculture, employment, and entrepreneurship. Henderson partners with WorkSource Atlanta, the workforce system for the City of Atlanta, to pay trainees in the program $15 an hour as they learn greater self-sufficiency by learning new skills, mainly farming. Nine Black youth have graduated from the program so far. The trainees even started a worker-owned cooperative to distribute their hot sauce, SweetSol, which Henderson makes alongside trainee Zion Franklin and student volunteers at Spelman College’s Teaching Kitchen as she tells the story of the rise and fall of Black economic power in the U.S.
“We’re pulling in folks doing all their different work and putting it in one spot. It’s a one stop shop for youth to learn to love themselves and get this knowledge,” Henderson says. Franklin, an 18-year-old who has known Henderson since he was 12, bonded with his fellow trainees during the program and thinks of them all as a team. G2G has not only taught him new skills, but also character traits that will come in handy as he continues to pursue farming. “One of the most important things I have learned is patience because everything’s not going to happen when you want it to. Some days it will be raining, or it will be too cold outside when we go farm, and I just have to have patience to continue the task at hand and not give up,” Franklin says. The program has had myriad positive outcomes. Instead of getting into fights, the trainees are now breaking them up, Henderson says. Trainees receive political education from Black community members who are immersed in local movement-building, which has helped them understand their neighborhoods better and how to create change in them. Collaborating with community partners is key for G2G. Henderson says that collaboration is what makes their model a top solution to fixing Atlanta’s issues, especially when it comes to healing and educating Black youth. G2G sells SweetSol to support its agri-business training program for young people aged 18-24, many of whom have been incarcerated. Black youth in Pittsburgh, one of Atlanta’s last Black working-class neighborhoods, are also learning how to be self-sufficient and take control of their community through farming. Community Movement Builders (CMB), founded by community organizer and attorney Kamau Franklin and a group of young people, works to develop sustainable agricultural businesses as a way to ward off gentrifiers in Pittsburgh. Pittsburgh is just one of many historically Black neighborhoods in Atlanta facing gentrification and displacement. Franklin says that Atlanta’s Black population is shrinking, and he’s right: According to Atlanta’s 2010 U.S. Census summary, Atlanta’s Black population dropped from 61 percent Black in 1990 to 54 percent in 2010. This may not seem like a huge difference, but Black Atlantans can clearly see the changes afoot. CMB teaches Black youth that whether you’re able to take care of your community is a better measure of progress than capitalist goalposts. They’re starting two cooperative enterprises: a brand of kale chips called Raising Kale and an aquaponics business, where fish and plants will be grown together in one integrated system. The youth are learning how to provide their neighborhood much-needed fruits and vegetables — how to farm, sell their produce, and run a farmers market. Teaching young Black people how to farm may not sound revolutionary, but organizations like G2G and CMB are proving that it’s transformative. Their work aims to liberate Black people in one of the country’s Blackest, most rapidly gentrifying cities. It’s an alternative to the solutions that Black communities are often told will fix unemployment, food insecurity, mass incarceration, gentrification, and displacement, but never do. One of those false solutions is subscribing to capitalism and rugged individualism, an approach that’s left too many behind who aren’t able to “pull themselves up by their bootstraps.” Atlanta has the worst income equality in the U.S., and the Black unemployment rate is 22% in the city, more than three times the unemployment rate of whites. As mentioned earlier, relying on police, prisons, and the State is another false solution that often creates problems for communities of color instead of alleviating them. Black Atlantans are becoming aware of how institutions and systems that are supposed to help actually cause them harm. More and more are engaging in interventions like urban farming and cooperative economics that lift up entire communities instead of just a privileged few and empowering youth to lead them, since they’re the ones shaping Atlanta’s future. Their reasoning is that the more Black folks in Atlanta can depend on themselves, the better off they’ll be, and they point to history (i.e. Reconstruction) as proof. Eva Dickerson, a 22-year-old Spelman student and self-identified “farmer-in-training” who invited G2G to make their hot sauce on-campus, named why the emerging movement of young Black farmers in Atlanta is both potent and timely. Denechia "Neesha" Powell-Twagirumukiza is a longtime writer and nonprofit professional who conspires in the name of liberated Black futures, Queer & Transgender Black/Indigenous/people of color power, solidarity economics, and transformative justice/community accountability. For nearly a decade, they've been immersed in grassroots social justice movements in the Deep South and the Pacific Northwest.